QVC offered a Today’s Special Value of a Belleek covered casserole dish a few years back. You could order either the plain basket weave design or basket weave with shamrocks. I chose the plain basket weave option because I could use it with other china and not just my Belleek. This is a fabulous casserole dish. 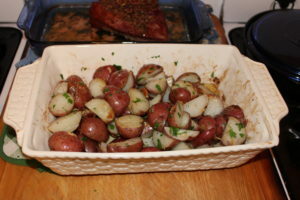 It serves well in the oven, and looks great on the table. I last used it on St. Patrick’s Day for my roasted potatoes.